Easter weekend in the Gatlinburg and Pigeon Forge area as always offers fun for the kids, with the Easter Bunny hiding eggs all over, and several events to note for celebration and worship. Easter comes quite early in 2018, starting Friday, March 30 through Sunday, April 1. Many of the later April spring events haven’t started yet, but Snow Tubing is still on at Ober Gatlinburg, with the last day on Easter Sunday. This is definitely a thing to book in advance online, since it’s always hugely popular. Arts & Crafts make their first appearance of the year with the Great Smoky Arts & Crafts Community Easter Show, Thursday through Saturday, March 29-31, 10 am to 5 pm. This is a free show at the Gatlinburg Convention Center, with our huge local artisan community stepping out of their winter studios to show their new creations, offer demonstrations of their skills, and generally enjoy the visitors. It’s always an eye-catching array of wares on display. Saturday is the big egg day, and Gatlinburg and Pigeon Forge both offer lots of fun.In Gatlinburg, the Easter Eggstravaganza is a free event on the Plaza at Ripley’s Aquarium of the Smokies. There will be crafts, games, prizes and a chance to get your photo with the Easter Bunny. This event is 11 am till 4 pm. Meanwhile at Mynatt Park, the local police once again are putting on a treat for the kids and grown ups, with their Easter Egg Hunt. The event starts at noon with a free hot dog lunch (! ), and then at 1 pm the Hunt begins. This is for ages 0-12, with three age divisions. Over in Pigeon Forge on Saturday there are two events happening literally side by side. Patriot Park is the venue again for the free Easter Egg Hunt and a chance to run into the Easter Bunny for a furry hug. This event is for children aged 0-12, with the Hunt itself divided into separate age groups, with lots of prizes and LOTS of eggs! There will be inflatables and games, with the fun starting from 10 am. and the great Hunt beginning at 11 am. Patriot Park is also the hub for the Pigeon Forge trolley system, so although there’s plenty of parking, the trolley might be a fun option too – either for arriving or taking a jaunt afterwards See our guide to the trolleys – a fun way to get around Gatlinburg and Pigeon Forge, even out to Great Smoky Mountains National Park, or over to Dollywood. 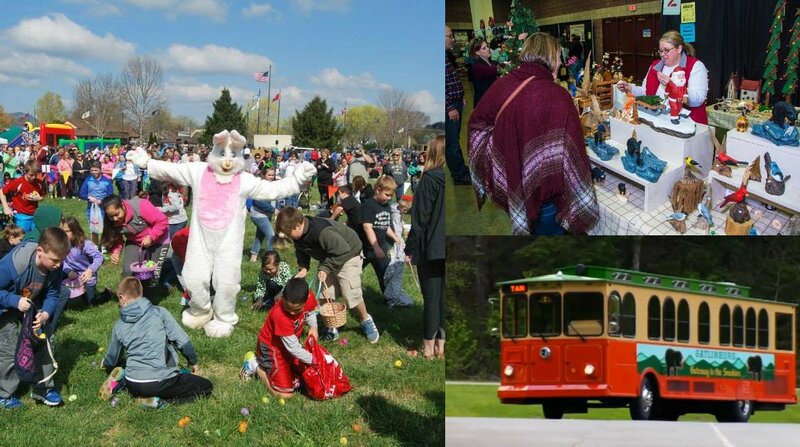 Meanwhile, right next door at the famous Old Mill Pottery House Cafe & Grille, the annual Breakfast or Brunch with the Easter Bunny happens from 9:30 to 11 am. This requires a reservation, and seating is limited in the restaurant. Call Marvelle Sewell at 865-406-6558 to make reservations, and click to view the Menu. Sunday is the Day itself, and a unique opportunity to worship is offered by Ober Gatlinburg, up on the ski area’s Mt. Harrison. 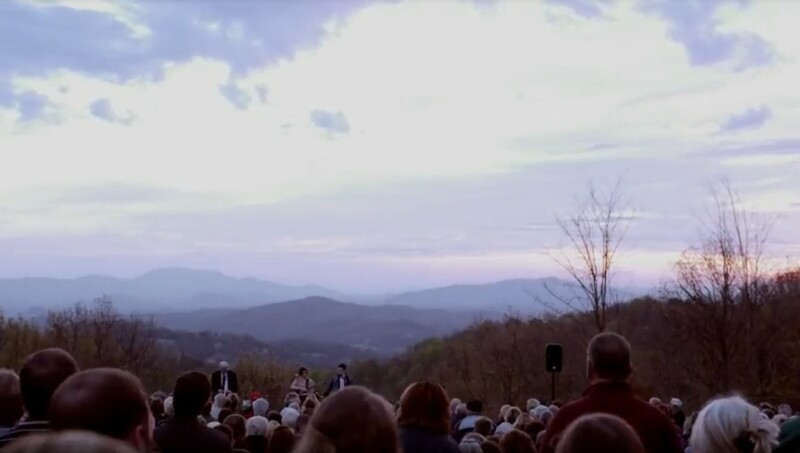 The Easter Sunrise service begins at 6:30 am with outside seating on the mountain (indoors if the weather’s bad), where worshipers can watch the sun rise. The service will be led by the Gatlinburg Ministerial Association, which will use the offerings for the needy. You can drive up to the ski area and receive free parking for the event, or take the Aerial Tramway from downtown Gatlinburg free of charge, starting at 5 am. Once at the resort, a breakfast buffet is available from 7:15 am. See the Ober Gatlinburg site for more information. And for other places of worship, see our guide to Churches in Gatlinburg & Pigeon Forge. Finally, on Sunday, there’s another chance to catch the Easter Bunny all day from 11 am to 6 pm at The Incredible Christmas Place in Pigeon Forge, at 2470 Parkway. This year-round Christmas store puts on an Easter bash for the kids and selfies too. Call (865) 453-0415 for more information0. And if you’re in the Pigeon Forge area, or on a trolley, you may want to spend the day at Dollywood, which is featuring its Festival of Nations event through April 9. And for more information about just about everything happening in the area, check our many guides to the vast amount of Things To Do in Gatlinburg – and Pigeon Forge and the surrounding Smoky Mountains area, of course.